Highlights: take a rowing boat trip on small waterways, experience the true life of the delta region as you visit its fruit orchards & coconuts groves. The Mekong River, the longest river in Indochina, is divided into nine tributaries within Vietnam and spans the vast Mekong Delta. The Delta is often referred to as the “ rice bowl” as it produces three harvests per year and the “garden of heaven” because of its rich soil which is ideal for growing fruit, vegetables and flowers. 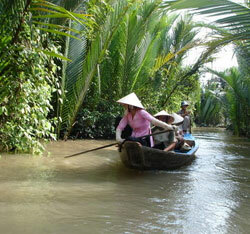 Riverbanks are laden with coconut palm, rice fields, orchards & stilted houses. On the arrival at My Tho, visit Vinh Trang pagoda, take a leisurely boat ride along the river, view stilt houses, fruit plantations and fishing villages along the river bank. Proceed to Tortoise islet, have lunch in the orchard garden. Then a boat ride to An Khanh - a less touristy attraction in Ben Tre, enjoy cruising on a hand-rowed sampan under the shadows of the water coconut trees along natural canals. Take a short cycling trip ( applied for private tour/ if time permits) then enjoy seasonal fruit & honey tea to the sound of "southern Vietnamese folk music" performed by locals. Visit a family business which epitomizes the idyllic rural lifestyle, taste delicious coconut candy & observe the pastoral life as you roam through the fruit plantation and village. Meet the bus and return to HCMC. This trip provides a fascinating insight into daily life in the Mekong Delta and you are guaranteed to take home your own private collection of beautiful memories. Included: AC bus, English speaking guide, 1 set lunch, fruit, honey tea & all entrance fees. Excluded: personal costs, drinks and travel insurance. Cai Be is 136km from HCMC. Depart early in the morning stopping to take photos in Tan An town overlooking picturesque flat rice fields. After 2.5 hour drive, set off y motor boat to visit Cai Be floating market, the typical cultural lifestyle of the Southern region, watch the locals trading fruit and many other commodities on board their vessels. Then wander into small villages to visit orchards and fruit plantations. Continue to Binh Hoa Phuoc islet, the green pearl of Vinh Long town, through the lush green vegetation of canals to the orchards where you can immerse yourself in nature. Enjoy a lunch of fresh river food & tropical fruit served in the heart of the garden accompanied by tranditional southern Vietnamese folk music. Take a delightful walk through the bonsai garden. Included: AC bus, English speaking guide, boat trip, 1 set lunch, fruit, honey tea & all entrance fees. 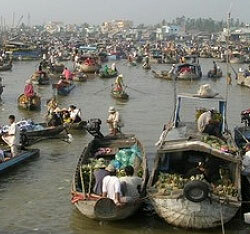 Itinerary: HCM- My Tho- Ben Tre- Can Tho- Cai Rang, Phong Dien Floating Market. Highlights: the tour takes visitors deeper into the Mekong Delta to observe the vast rice fields and waterways of My Tho, Ben Tre & Can Tho. It gives a close insight into the fascinating rural life on the Mekong River. 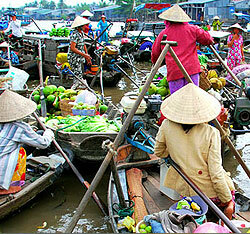 Explore the aspect of trading on a river with Cai Rang & Phong Dien floating markets. The water is teeming with boats of all shapes and sizes and the Mekong comes alive as you cruise past fishing boats, cargo vessels & even floating houses, traditional junk & Vietnamese/ Western dinner. Day 1: HCM- My Tho- Ben Tre- Can Tho ( L). 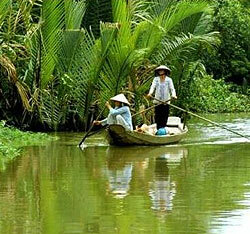 Leave HCMC, enjoy the scenic journey along the National Highway bordered by green rice fields. On the arrival at My Tho, visit Vinh Trang pagoda, take a leisurely boat ride along the river, view stilt houses, fruit plantations and fishing villages along the river bank. Proceed to Tortoise islet, have lunch in the orchard garden. Then a boat ride to An Khanh- a less touristy attraction in Ben Tre, enjoy cruising on a hand-rowed sampan under the shadows of the water coconut trees along natural canals. Take a short cycling trip ( applied for private tour/ if time permits) then enjoy seasonal fruit & honey tea to the sound of “ southern Vietnamese folk music” performed by locals.Visit a family business which epitomizes the idyllic rural lifestyle, taste delicious coconut candy & observe the pastoral life as you roam through the fruit plantation and village. Proceed to Can Tho. Overnight in a hotel ( family home-stay with dinner can be arranged on request). Free time to visit bustling Can Tho Market. Take a leisurely boat trip to explore the picturesque tributaries of the Lower Mekong river ( Bassac River), then proceed to Cai Rang floating markets ( & Phong Dien is optional) which are the liveliest in the whole religion. Have you eve tasted Vietnamese vermicelli soup? Well, now go and see how it is made. Then wander around the village and meet the friendly local people and experience how to across a “monkey bridge” which is built by only one item of bamboo. Visit the orchard garden.after lunch, back to Saigon by bus. Included: AC bus, English speaking guide, boat trip,1 breakfast, 1 set lunch, fruit, honey tea & all entrance fees,accommodation at 1star hotel. Excluded: personal costs, drinks and travel insurance, other meals not mentioned. 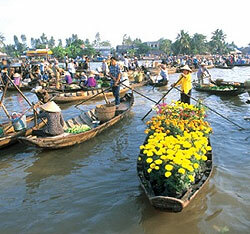 The itinerary is an extension of the two-day Mekong trip. After lunch, proceed to Chau Doc via Long Xuyen to visit a crocodile farm. Check in on arriving in Chau Doc. Admire the landscape from Sam Mountain summit down the Vietnamese – Cambodian border, visit the Caved pagoda. Overnight in Chau Doc. * optional: Tra Su cajuput forest a beautiful national biospheres reserve ( included: boat cruise, bird sanctuary,lovely landscape…. )can be arranged as request. Private tour or upgrade hotels will be provided as requested.